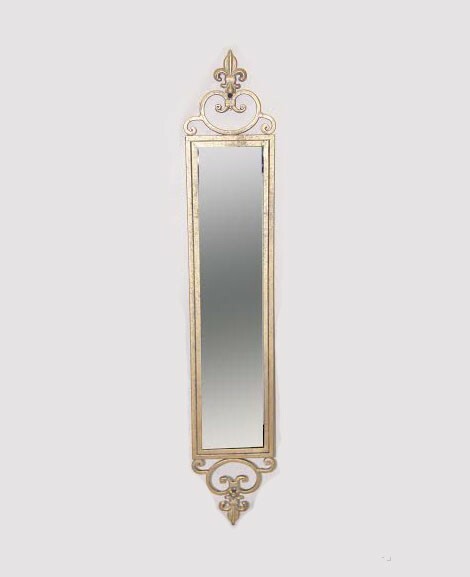 Gold Slim Baroque mirror. Great in corridors, hallways, alcoves and to open up small spaces. Hang alone or group in multiples above a sofa or mantle. •RECLAIMED TIMBERS: Each piece of furniture is totally unique with its own personal story to tell. •SOLID WOOD: Carefully hand-crafted from solid wood using traditional carpentry methods. •EXTENSIVE RANGE: With 14 different beautiful pieces to choose from you, can create your own bedroom combination. A grand statement piece. Each segment of glass is delicately placed by hand to create a piece which gleams from every angle. The wood finish is champagne gold for a subtle contrast with the strong beveled edges. This French Louis-period style furniture collection will add an elegant feel to any bedroom. The cabinets and bed frames are complimented by hand carved detailing which is then hand painted and lightly distressed. Carefully selected Mahogany wood is used for this range. The bed frames include a hand-woven rattan head and footboard. The Bordeaux Ivory Bedroom range refines a classic form, bringing a sense of subtle sophistication to the bedroom. The range is finished in a soft ivory paint with contrasting yet delicate silver handles, and features cabinets with gently bowed fronts, soft curved frames and beautifully turned legs. The detailed embellishments, together with a profiled top crest rail on the bed, will bring a tranquil and relaxed atmosphere to any bedroom. Additional features such as soft-closing runners, pull-out shelves and a jewellery tray allow for a superior customer experience. Bordeaux is a timeless classic conveying a sense of elegance and refinement. Silver circular mirror with rustic bead finish suitable for hallways and mantelpieces.